It's time for Canada to quit stalling and come up with safer and more humane ways to move animals from farm to slaughterhouse, animal rights advocates say. The federal government has been working on a review of animal transportation for more than two years. Geoff Urton of the BC SPCA said changes to make Canada's laws more like the European Union's are needed now to stop the "incredible" number of farm animals that arrive at slaughterhouses sick, injured or dead. Every year, hundreds of cattle and thousands of pigs and chickens die across Canada during long journeys in crowded conditions. "I don't think people realize just what is happening. ... I think they would be saddened," Urton said. The BC SPCA's is one of several voices in a national debate around the transportation of farm animals for slaughter. The debate was sparked in 2006 when the Canadian Food Inspection Agency, the federal regulatory body, initiated a review of its 30-year-old animal transportation laws and asked for submissions from a range of interested parties, including the meat and farming industry. The BC SPCA was invited to participate in the review on behalf of the Canadian Federation of Humane Societies. The association filed a detailed set of recommendations in August 2006, drawing heavily on practices in use across Europe. Urton called the European model "quite progressive," saying its laws are based on scientific reports produced by the European Food Safety Authority, the agency tasked with improving food safety in the EU following the mad-cow crisis of the 1990s. Among other things, the BC SPCA is calling on the federal government to ban the transportation of any animal deemed "unfit" prior to transportation unless permission from an inspector is granted. That would include animals that have recently given birth, newborn animals, mammals or birds that are unable to walk unaided into a container or vehicle, animals with deep, large wounds, animals too weak to stand, animals that are lame, in respiratory distress or with severe inflammations. The SPCA is also recommending reduced crowding on trucks and in containers to allow animals enough space to raise their heads, and adequate ventilation to prevent suffocation and reduce travel sickness , which is linked to poor meat quality in pigs. Canadian animals now are subject to long journeys, without food or water, of up to 52 hours for cattle or sheep, and 36 hours for pigs, horses and chickens. To reduce stress and risks of dehydration, the BC SPCA is recommending reducing transportation times to match those in Europe, where most species are not permitted to be transported for longer than eight hours. The CFIA has not yet concluded its regulation review. CFIA officials could not be reached Tuesday. According to CFIA statistics for the years 2001-2005, republished by the BC SPCA, more than 600 million farm animals are transported to slaughter in Canada every year, including 580 million broiler chickens, 32 million egg-laying and breeding hens, 21 million pigs, 19 million turkeys and three million cattle. Between two million and three million animals are found dead each year when trucks are unloaded. That represents an overall average mortality rate of 0.4 per cent for animals during transportation. More than 10 million farm animals are condemned for human consumption after arriving diseased or injured at the slaughterhouse and are euthanized. Urton said the numbers were disturbing, and urged more research to determine what's causing the majority of the deaths and injuries. "That is a red flag that there is something going on," he said. 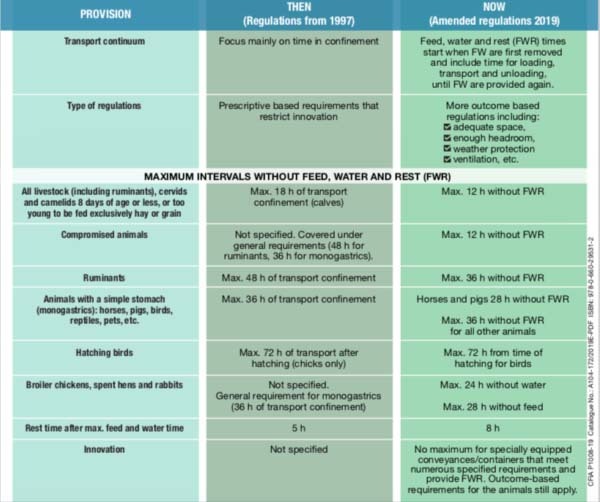 December 2016 comment & update: Under the planned new regulations, the basic maximum intervals for transport without feed, water and rest would be: 12 hours for compromised species and livestock eight days or younger; 24 hours for broiler chickens, spent laying hens, and rabbits; 28 hours for pigs and horses; 72 hours for day-old chicks; and 36 hours for “all other animals. METRO VANCOUVER — Drivers who follow behind trucks transporting chickens to slaughter may be at risk of inhaling or ingesting drug-resistant bacteria in airborne chicken feces particles, a study published in the Journal of Infection and Public Health concludes. For drivers in the Fraser Valley, which has a high concentration of producers and abattoirs, the study should reinforce some practical advice, says Dr. Gillian Arsenault, a medical health officer in the Fraser health region. A team of researchers from the Johns Hopkins Bloomberg School of Public Health set out to determine if transporting live chicken flocks from farms to processing plants causes potential exposure to antibiotic resistant bacteria. Researchers conducted their study in a region — the Delmarva Peninsula in Delaware, Maryland and Virginia — that is said to have the highest density of broiler chickens per farm acre in the U.S. They followed transport trucks in cars that were two to three vehicle lengths behind for 17 miles with air conditioning turned off and windows down. They collected air and surface samples from inside and outside the cars. In many of the samples, they detected bacterial organisms that are resistant to common antibiotics such as tetracycline and erythromycin, which are used by humans and as additives for poultry. Air sampling when not driving behind chicken trucks did not detect such organisms. "This confirms the possibility of major pathogen dispersal via this route and highlights the importance of better containment of animals and waste," the study says, adding that the organisms remain viable on surfaces for 20 minutes. Antibiotic resistance occurs because of overuse of antibiotics and previous research has demonstrated a link between the antibiotics used in food animal production and antibiotic resistance. Lead author Ana Rule said some, but not all, of the researchers wore masks while following the trucks. No one got sick and the study doesn't prove illness could result. "Unfortunately, we cannot yet answer those questions," Rule said. " Our study is limited in that it shows that bacteria - including some resistant to antibiotics - are coming out of the trucks, and that there's a chance that people are exposed to it, but there is no link yet to disease." She did not know yet what concentration of bacteria might be required to cause infections. Rule said it would be simplistic to pass off the research with the mere conclusion to avoid driving behind such trucks. "That's not the point. Antibiotics are a very important tool in the fight against disease, and the way the industrial farming industry uses these drugs - applying constant low doses to millions of animals - makes possible the emergence of resistant disease-causing bacteria, thus compromising the ability of medicine to treat disease. "Our study shows that these bacteria are being disseminated into the environment. Are you supposed to move if chicken trucks go by your house? And what about the bacteria that deposits on soils and waters along their route? This is a broader issue." George Johnsen, plant manager of a United Poultry Co. Ltd., processing plant in east Vancouver, said antibiotics are used only on sick birds, not for prevention, and "90 per cent of our birds have never gotten antibiotics." Rule said antibiotic-resistant germs and infections are also acquired in hospitals or in communities, from poor sanitation or contaminated food and water. But in animal production "the threat is that more-drug-resistant bacteria are being released into the environment without anyone paying attention." The next step will be to investigate the possible health effects for people living along routes used by chicken and other animal transport trucks. Dr. Perry Kendall, chief provincial health officer, said while the study is novel, the results don't surprise him because "about half of the antibiotics in use in North America are used in the agri-business, in cows, swine and chickens particularly." Kendall said there's no doubt that some of the antibiotic resistance occurring is a result of antibiotics given to animals raised as human food sources. Still, he said he presumed that live animal transport and transmission represent a less common cause of infections than such things as handling raw foods or eating undercooked foods, thereby contracting food poisoning illnesses such as salmonella. "If you were trying to trace an outbreak of say, salmonella, you wouldn't think to ask if people were driving behind chicken transport trucks," said Kendall. He agreed that people might avoid driving closely behind chicken trucks, but added: "I'd like to read the study before understanding the implications and offering any advice." Arsenault said the study provides an opportunity to stress the importance of handwashing. She praised the researchers "because the more we understand about infectious disease, the smarter we will become in preventing it." Curb the Cruelty: 2010 WSPA report reveals huge problems with Canada's farm animal transport system and the CFIA. Note: In June, 2014, WSPA changed its name to World Animal Protection. Six full days of court hearings are set for two charges brought by the CFIA against Maple Lodge Farms (MLF), a huge poultry slaughter company based in Brampton, Ontario. Court hearings are taking place at the Brampton Court House. A total of 60 infractions against MLF were in question, but the Crown charged MLF with two transport infractions under Section X11 of the Regulations under the Health of Animals Act. The cases involve the deaths of large numbers of broiler chickens and spent hens transported to MLF for slaughter in bad weather. CCFA has been observing court procedures and is encouraged the CFIA is acting on the charges in court, and not simply applying monetary fines which seem to be considered by industry as little more than a cost of doing business. Note: This company has had other charges brought against them for various violations, including those in 2009. In 1982, there were violations under the Export and Import Permits Act.